We stock products that are high quality, environmental friendly, contain organic ingredients and are suitable for babies, children and adults who only want to put the best on and in their bodies. We stock brand names - Weleda, Green People, Barefoot Botanicals, Earth Friendly Baby and Kids, and a range of vitamins and minerals Tisserand, Faith in Nature, Vogel, Cytoplan, Lamberts and Laughing Birds. Weleda products are made with totally natural ingredients and are 100% free from synthetic preservatives, mineral oil derivatives and colourants. 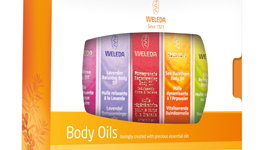 Founded in 1921, Weleda continues to provide products that suit your own individual requirements: products for men, women and children, people of all ages in different phases of life. Earth friendly baby products are 99.2% natural, they do not contain artificial colours or fragrances and are SLS and Paraben free. They are dermatologically approved and the gentle blends are ideal for babies and sensitive skin. We believe Lamberts to be the best range of vitamins and minerals on the market. 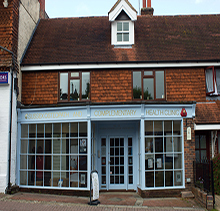 We have a good range of their products in the clinic. Tisserand aromatherapy products are made with pure essential oils - perfect for nourishing your skin and senses. We also stock a range of Tisserand products inspired by the National Trust. Hot and cold treatment is important in a lot of muscular injuries. These packs provide a great way of carrying on that treatment at home. 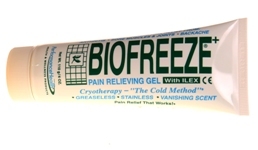 A fantastic cold gel that gives temporary relief to minor aches and pains in muscles and joints. Suitable for use by adults and children 2 years of age and older. Their S.O.S range is a lifeline for suffers of dry, irritated skin. Its advanced therapeutic formulas are gentle enough for babies, children and adults, and every product is suitable for those with eczema, psoriasis, or withdrawing from steroid treatment. ‘We also stock the Barefoot Botanicals range of Repair and Renew creams, which are suitable for all skin types, especially mature or dry skin’. Made in Wales and sourced from fair-trade, organic, local and home grown ingredients, Laughing Bird products are a sumptuous, wholesome and nourishing range for people of all ages. 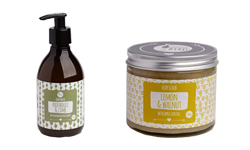 ‘Faith In Nature’ products are made with natural ingredients that care for you and the environment. They are free from artificial colours and fragrances and do not contain Parabens or SLES. 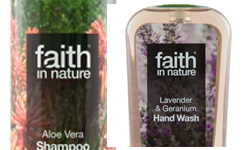 We stock an extensive range of Faith In Nature shampoos and conditioners as well as a variety of hand washes’.